Accounts of the Conflict is working in partnership with story collecting projects to create a digital archive of personal accounts of the conflict in and about Northern Ireland. This article – written for The Legacy by the project team – outlines their plans. 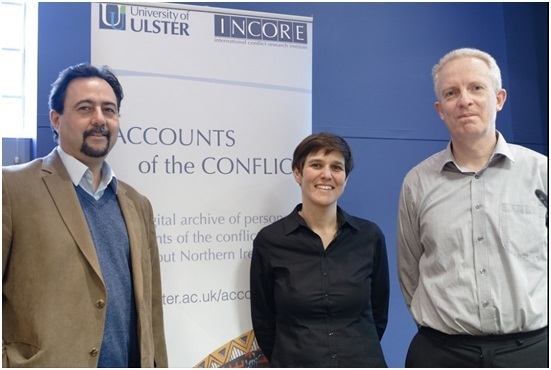 Accounts of the Conflict is a University of Ulster project about Northern Ireland’s unique conflict heritage, based in INCORE (International Conflict Research Institute) which is funded from the European Union’s PEACE lll programme, managed by the Special EU Programmes Body. Over the last 30 years many people and organisations have collected parts of this tapestry of troubled lives yet some of the stories compiled over the years are already lost because no mechanism existed for preserving them permanently. Many other stories are held in local collections that are both difficult to trace and negotiate access to. As time has moved on, many of the people who witnessed, got caught up in, or actively took part in, the early period of the conflict are dying, and their recollections of the conflict are dying with them. There is now an opportunity for the university to work in partnership with some of the organisations and individuals collecting these personal accounts in order bring them together and preserve them before they are lost forever. All of these accounts will form an important part of the legacy and heritage of the conflict. The collection of oral histories, stories or testimonies (as they are variously called) of individuals affected by the conflict, has grown in popularity and prominence, particularly in recent years. This process is often cited as one of many approaches to dealing with the legacy of the past conflict in Northern Ireland. In early 2013, INCORE embarked on the Accounts of the Conflict project. The establishment of a digital repository, or archive, will be at the core of the project. This will provide for the long-term storage and preservation of personal accounts of the conflict in and about Northern Ireland. The digital archive will hold audio, audio-visual and text formatted versions of stories. The material in the repository will be sourced from previous or current story gathering projects that wish to avail of the benefits of the long-term preservation and dissemination that can be offered by Accounts of the Conflict. One of the major strengths of the project is the University of Ulster’s commitment to the long-term support of the digital resource beyond the funded period. Such stability will ensure optimum preservation and access, while allowing future storytelling projects to deposit digital versions of stories/testimonies via the Accounts of the Conflict website. The website, to be launched in the autumn of 2014, will be closely linked to the existing CAIN (Conflict Archive on the Internet) website. CAIN is the premier online resource for information about the Northern Ireland conflict. Since 1997 the CAIN team have built a comprehensive collection of material that will be used to contextualise the information presented on the Accounts of the Conflict website. Visitors to the latter will be able to search a comprehensive database of information on personal accounts of the conflict. Extracts from a range of these accounts will be available to view online where appropriate permissions have been obtained. A scoping exercise has been completed which identifies the current and earlier story collecting projects. The project team has met or had a conversation with the majority of current projects and has begun to work in partnership with those who see a benefit in the deposit of their materials with Accounts of the Conflict. We will continue to liaise with projects over the coming months and there are still some projects that remain to be met. We also welcome contact from individuals or groups in possession of stories who would like to see them securely stored, preserved and available to access. The project raises important ethical and methodological issues. The project team works closely with its Local Advisory Group and a team of International Advisors that have been appointed to address these issues and to ensure that we progress to the highest standards. The project also offers a number of technical challenges such as how to store information available in different formats (e.g. video, sound). Addressing these challenges is an ongoing process and, with the hardware now in place within the secure data area of the University of Ulster, the project team is currently testing the software that will support the archive and also facilitate lay-friendly access via the new website. The project includes a number of dissemination and capacity building activities. First of these is a seminar series where we have been able to invite our International Advisors to give public seminars on their work. We have already attracted over 200 people to hear from experts about the digital archiving of stories, including stories on textiles. Three further seminars are arranged. Second, we will go on the road in the autumn demonstrating the archive across Northern Ireland and the Border region. Finally, we are currently planning an International Conference (17-18 November 2014) where we will share what we have learned in the process and ensure that Northern Ireland is at the forefront of the international debate on the role of the digital archiving of stories for peacebuilding.